Today we visited Vanya at his camp, which is where his children’s home resides until August. The Ukrainians believe that it is important for kids in the city to get out into the country and have fresh air and trees during the summer. So, he is about 30 minutes outside Kiev. While out in the country a bit, the facility appears much more of what I envisioned his home facility to look like – more like an institution style of place. It made me thankful for his home facility which looks like a cute U.S. daycare. Vanya (yes, still calling him that for blog purposes for now) was much more relaxed and we got to see a bit more of his personality. He was talking away to me …”Mamma…sldkfjwioefnwefowiegejno”. I could only understand the “Mamma” part, and I loved it! We brought him a little treat, which he gobbled down (we will need to do a little fattening when we get home) and we gave him the picture book that our kids at home made for him which had pictures of themselves, family and pets. He loved the book and he kissed me for the first time… Vanya was so proud of his picture book and he showed it to the other kids. I wondered what the other kids thought when they saw the pictures of his family….did they wonder if a family was ever going to come for them? Did they wish that we had come for them instead? My heart ached and I’m crying as I think about it. I hugged as many of them as I could. 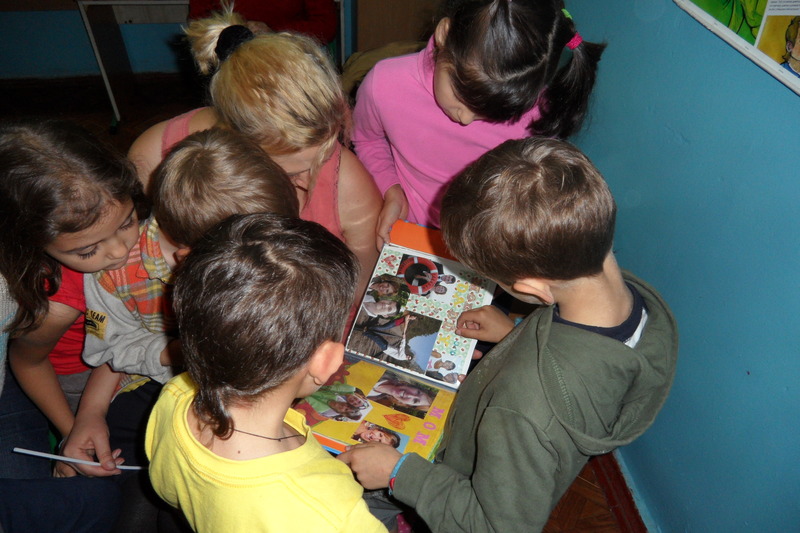 While at least these kids seem to be taken better care of than a lot of other orphanges in Ukraine (or many others around the world), it can never replace having a family, a home. I will never stop praying for the orphans of our world. And I am so thankful of my adoption into God’s family, and can only hope that I will become a sister to all those without familes on this earthly world. Vanya has a (half?) brother (not sure if I mentioned it before). He is around 12 years. Vanya lived with his mother and brother for the first 6 years of his life until they were taken away from her because of neglect. When that happened, the dad took the brother but not Vanya becuase he doesn’t believe he is his child. The dad was firm that there should be no contact between them. They told us that it was very difficult for Vanya, and that he grieved for a long time. My thoughts are that if mom was neglectful, the brothers probably had to look out for each other, the older may have even “parented” Vanya. What a lose for him at such a young age – of a mother and his brother. While the process seems to be going great so far, this is the first international adoption from this home, the first adoption our facilitator has done in this area of the region in his 12 years of doing this, and there are not many adoptions from this region. Hopeully for our facilitator, in a country where who you know is important, we hope this won’t slow things down or cause any problems. But, we’ve overcome some big hurdles, so I can only assume God will keep his finger on the “fast button” and I will be home with our son well before the end of July! Our family will be praying for you and your husband and family at home…so from Cincinnati to Ukraine and back know some prayers are coming 🙂 We are so excited you are sharing this journey too – my older children now 8 were adopted from Russia and love to hear about children getting their families!! Are you visiting once or twice each day? Loved Vanya showing off his book about his family. It’s been a long time coming for him…AND loved hearing about his first kiss. Tears. Wonderful post Kristin. I can feel your emotions through your words. Vanya is such a warrior, such a blessing. Your story is one of the most beautiful I’ve had the privilege of being part of. Prayers and love are with you and your family always! Praying for you, sweet Fisher family! Thank you for writing in detail. Feel like we are making this journey with you. I know that is what the family of God is all about. We are praying. How His Grace, Peace, and Joy is covering you as a blanket. I have a word of advice for you: learn as much as you can about the brother — names, addresses, ages, places, etc. Record any and all information that you get from Vanya and any other sources. The reason: in the future, it’s very reasonable to assume that he may wish to find his brother. The more information you have, the easier it will be for him to find his sibling. If you have someone to translate for you while you’re over there, I’d try to get as much info as possible from Vanya — the sooner, the better, as the more info you can get and the more accurate it will be. Otherwise, you’ll have to wait until he learns English, and his memories will fade very quickly once he’s removed from EE. I say this as an adoptive parent of a child who had a similar birth family situation. We’ve had an awful time finding her sister now that they’re both adults. I wish, wish, wish I had written down the info that was available to me way back when. For instance, as a child, she remembered her sister’s last name — different from her birth name — but we can no longer recall it. Same with the address of the home where she grew up. All this info would make finding her sister much, much easier. This is my one, major regret. It breaks my heart that she has yet to find her biological sibling. I know some adoptive parents feel threatened at the idea of a child tracking down his/her birth family, which is sad. In my experience, I believe it’s an important part of the child’s identity; one that should not be denied. I just wish I had had the foresight to record information that would have aided in our search, now decades later. Thanks so much for that advice. It’s funny, I just had this conversation with my husband and facilitator this a.m. My husband felt cautious because he is afraid that asking will bring up too many painful memories for our son, but your post helped him see the importance (while still done as delicately as possible via a translator). I know the conversation may be uncomfortable, but when my son grows up, I want to have as many answers for him as possible.